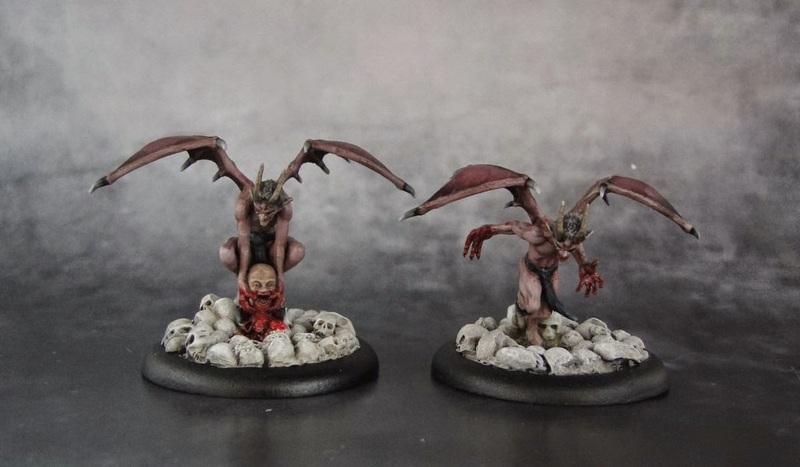 Young Nephilim are the next step in the evolution of Neverborn native to the world of Malifaux. Their growth is very fast and thus extremely painful. Their limbs become longer, the wings develop, which causes enormous pain to the creatures. The only way to lessen it is by consuming raw meat. They're so desperate that they'll even eat a still living, thrashing being as long as it gives them even a temporary relief. But their suffering has a purpose as a fully developed mature form is a true monster. But we'll get to that later. This cruel reality of their condition is well reflected by their profile. Their Wk of 5 is pretty standard but combined with Flight and a Cg of 8, they become incredibly mobile. Their melee attacks give them a chance to get into frenzy or... heal themselves after gorging on the remains of their latest victim. Overall, they are pretty solid melee fighters with high mobility at a nice cost of 6ss. Not to mention a 1ss upgrade, which gives them a chance to turn into a Mature Nephilim. Brilliant! The only thing I dislike are the skull-covered bases (but that's a matter of personal preference).